East Rutherford, NJ — Many of the sport’s stars assembled at The Meadowlands for qualifiers on an overcast, windless Saturday morning (April 13) on a track that may have been slightly dulled by overnight rains with the temperature at 10 a.m. in the mid 60s. Kissin In The Sand shows she is well prepared for a 4-year-old campaign with a facile victory in her first qualifying contest of the year. USTA/Mark Hall photo. The card began with the Grand Circuit stakes-winning Father Patrick filly Special Honor (Andy Miller) closing through the stretch to edge mile-cutter Fate Smiled (Matt Kakaley) in 1:54.4 with a last quarter mile in :27.2. Can’t Touch It (Scott Zeron) held safe for third and Goldsmith Maid winner Sonnet Grace (Yannick Gingras) fourth in a conservative effort. Brittany Farms, Marvin Katz and Al Libfeld bred and own the winner, trained by Julie Miller. Hall of Fame trainer Linda Toscano has a sharp looking prospect in the 3-year-old Muscle Hill colt Guaranteed (Tim Tetrick) who won his second qualifier in as many tries this morning by closing furiously under no urging into a :27.2 last panel of a 1:54.4 mile to nip Halliama (Trond Smedshammer) and Summit In Sight (A. Miller). The winner, unraced at 2, was a $125,000 Lexington Selected Yearling Sale purchase by Michael and William Pozefsky and Myron Eckstein from breeders Tommy B. Andersson and Courant AB. Matter Of Fact (Marcus Melander) who led throughout and the closing French Café (A. Miller) went under the wire together in 1:55.4 with a last quarter mile in :28.1 in race three with the latter prevailing by a nose. Golden Tricks (Ake Svanstedt) was third. French Café is another daughter of Father Patrick, a Katz & Libfeld homebred again stabled in the Julie Miller barn. Miss Trixton scored for Melander from just off the pace in 1:55.3 with a last quarter mile in :27.4 over Trix Are For Kids (Corey Callahan). The winner is a Trixton filly from $1 million winner Possess The Magic and is a $105,000 Lexington Selected Yearling Sale purchase for the Order By Stable from breeder Hanover Shoe Farm. Last year’s International Trot winner Cruzado Dela Noche (Mattias Melander) was sharp in his 2019 bow leading all the way and trotting a :26.3 final quarter to hold off Top Flight Angel (A. Miller) in 1:53.3. Yes Mickey completed the three-horse field. All three of these trotters are eligible to the May 4 Cutler Memorial, the first major stake of the 2019 Meadowlands season. World champion Ice Attraction (Andy McCarthy) is back for another season versus the top mare trotters and got her year underway with a front stepping 1:55.4 with a :27.4 final quarter panel effort under her own power. Muscle M Up (Sarah Svanstedt) outmuscled EL Platinum and her husband, Ake, for the place with a nice stretch move. 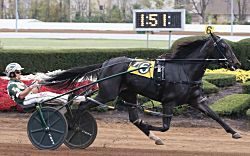 All three are trained in the Svanstedt barn and the husband owns the winner with Sipple, Burroughs and Little E.
Dan Patch award winning 2-year-old pacing filly Warrawee Ubeaut (Gingras) got her sophomore season off to a great start. She is the fastest freshman in harness racing history by virtue of her 1:48.3 Red Mile win last fall. The filly scored from second over in 1:53.2 with her final quarter in the 26 second range. Stonebridge Soul (Dexter Dunn) went well to be second with She’s Allright (Kakaley) third. Warrawee Ubeaut is from the first crop of Sweet Lou and was a $70,000 Lexington Selected Yearling Sale buy for Burke, Collura, Silva, Purnell & Libby and Weaver & Bruscemi from breeder Warrawee Farm. Gingras and Burke came right back with the good American Ideal sophomore filly pacer St Somewhere for a 1:53.4 win with a :27.2 decision over stablemate Sylph Hanover (Kakaley) and Fool Me Again (Dave Miller), who closed with good pace, for third. St Somehwere shares her ownership group with Warrawee Ubeaut, who bought her from breeder, Crawford Farms, at the Lexington Selected Yearling Sale for $55,000. Kissin In The Sand was absolutely vicious in her return this morning, loping along through even fractions before dragging Scott Zeron home in :26.3 in the last panel for a 1:51.2 mile. The defending Dan Patch Award-winner won by open lengths over her nemesis from last season and fellow Dan Patch Award-winner, Youaremycandygirl, (Gingras) who was reserved early and not asked by the driver. Kissin In The Sand is trained by Nancy Johansson for Marvin Katz and Bud Hatfield. Captain Victorious (A. Miller) closed in :26 to record a 1:52.1 win for the Millers, besting Caviart Rockland (Zeron) and Sugar Factory (D. Miller) in a race where all six looked good. The $40,000 Lexington Selected Yearling Sale, White Birch Farm product races for Andy Miller Stable, Goehlen and Huffman. Love Me Some Lou (D. Miller) was a 1:52.2 winner with a :26.4 quarter for the Cancelliere brothers Tom (trainer) and John (owner). The Sweet Lou $95,000 Lexington Selected Yearling Sale purchase sat just off the pace and roared by when asked. Blood Money (Zeron) and De Los Cielos Deo (Gingras) were next across the line. Spring Haven Farm bred the winner. The 12th and final qualifier was easily the best race at the Meadowlands season to date, pari-mutuel or not. It saw Filibuster Hanover (Gingras) emerging from the packet to go by the front-running Dealt A Winner (D. Miller) with a :26.2 end to a 1:51.1 mile. The winner races out of the Ron Burke barn. Results and eventually race replays are available on the Meadowlands website. Live racing tonight at 7:15 with the World Harness Handicapping Championship taking place in the building. Walk-up registrations will be available until 7 p.m. Saturday. For more information, call 201.842.5015 or please click here.